At the start of a trip psyche is always high, it’s only after a few routes that things start to calm down. Unfortunately for us things got off to a bit of a false start: our flight was delayed overnight in Iceland after a passenger fell ill, then upon arriving in Calgary a day late we were somewhat alarmed to see the temperature soaring at a whopping 11oC (40oC above what it was when Nick was last here) – great for ice cream, less great for ice. 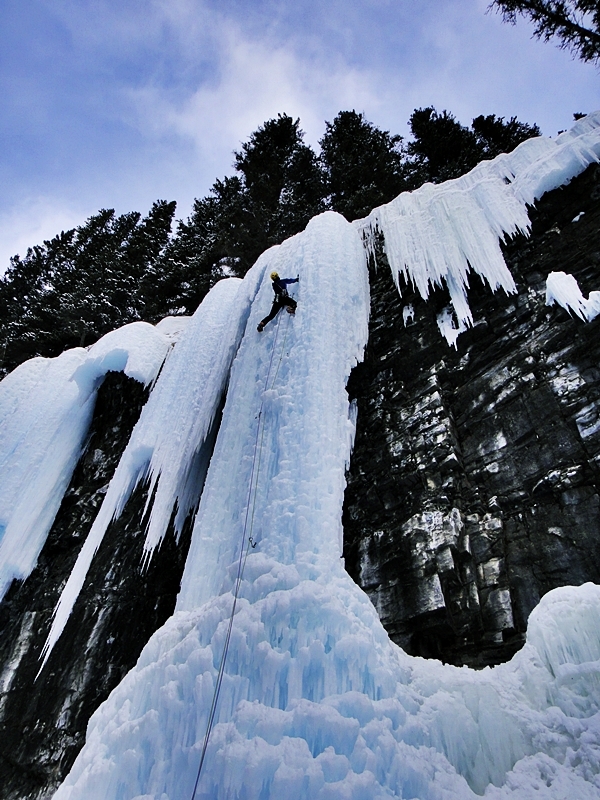 As if this wasn’t enough we read seven big, bold letters next to the Banff Avalanche Report – E-X-T-R-E-M-E. So it’s going to be like that is it? All was not lost. Nick ‘Happy’ Bullock doesn’t lose faith that easily and Rob ‘Chopper’ Greenwood was psyched to hack apart some of this classic ice he’d been hearing so much about. To look at it optimistically, these dark times could be used as a warm up so that when things turn good – we were on it! 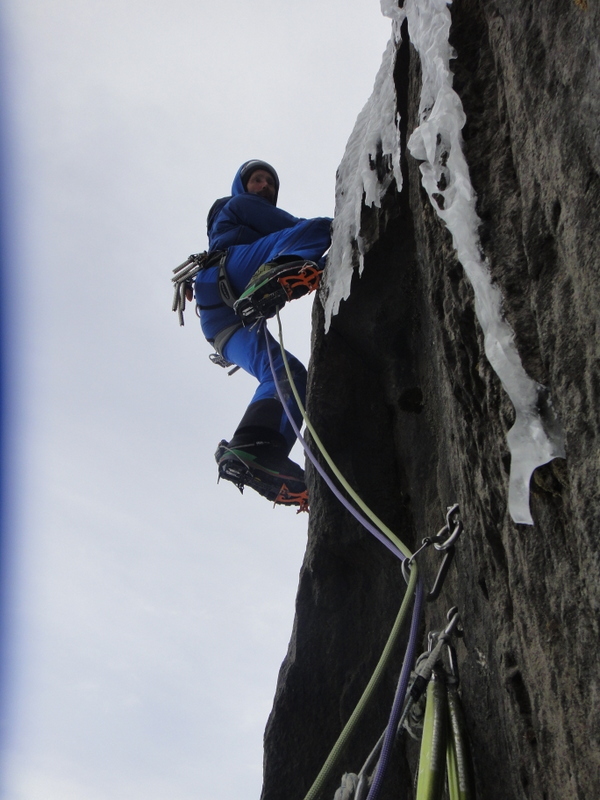 Two days of ‘warming up’ later I was a feeling pretty worked… There is something about Scottish Winter that doesn’t prepare you for repeatedly sustained pitches of WI5 + 6. 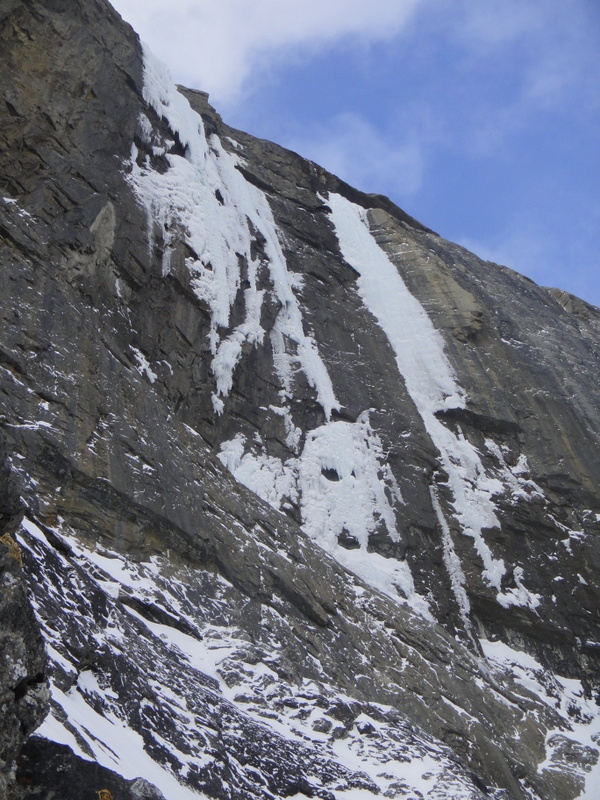 So I conjured an excuse for a rest day – “Nick, how about we take a walk up to The Trophy Wall and see what conditions are like – we could set a bit of a trail for later in the week?”. 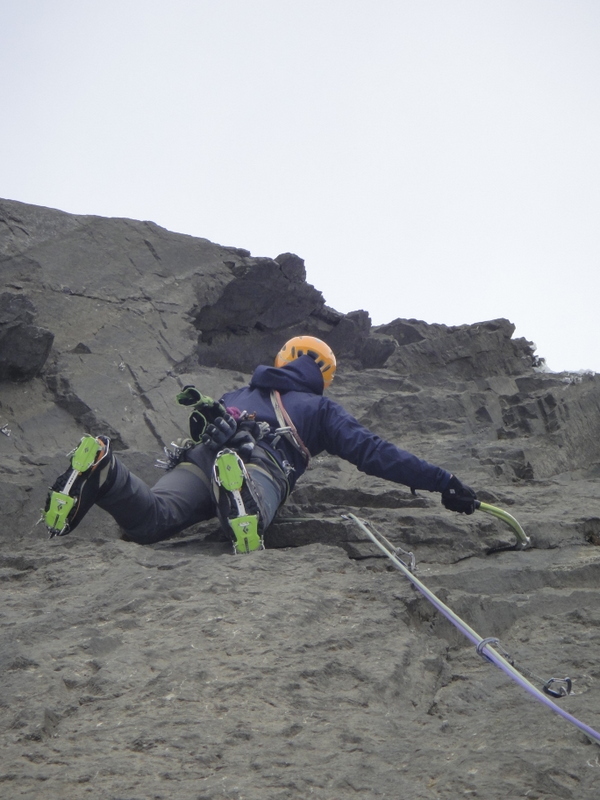 It wasn’t entirely convincing (or restful), but it played to my strengths – I am a much better walker/runner/ plodder than I am a climber – and gave my arms a 24 hour window of opportunity to flush the lactic acid. 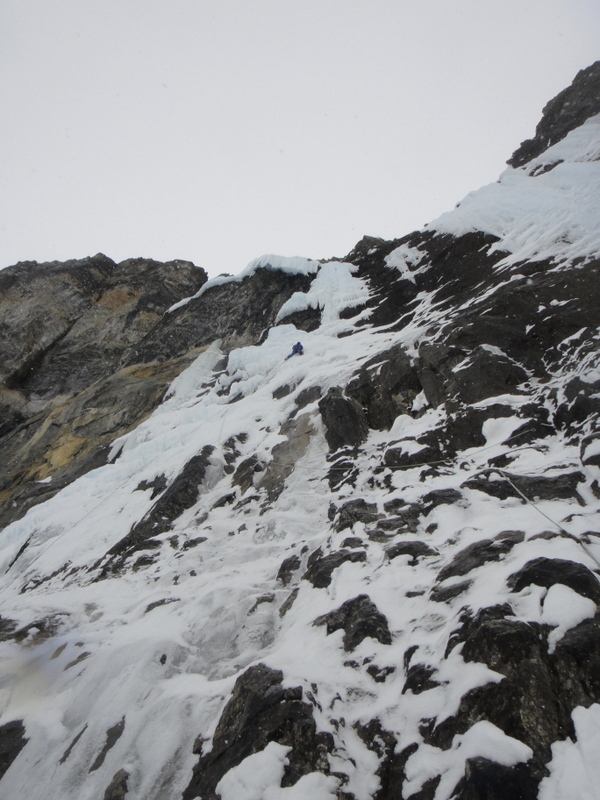 With a trail half way up to The Trophy Wall our plans were in place for the following day. Maybe a change of plan was required? 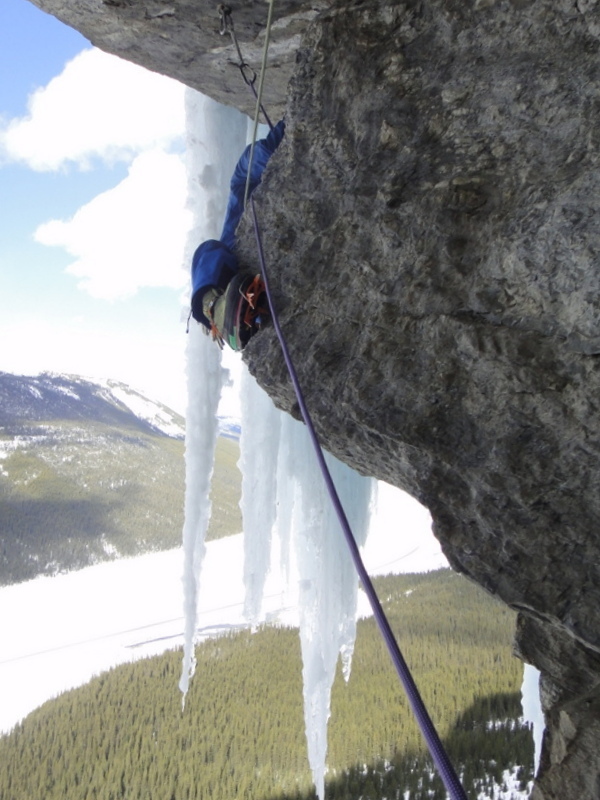 As if by fate we had been reading an article in the Canadian Alpine Club Journal about a selection of traditional routes put up by locals Raphael Slawinski and Jon Walsh – one in particular caught our eye. For a full account of ‘No Use in Crying’ click here to read my report or visit Nick’s Blog. 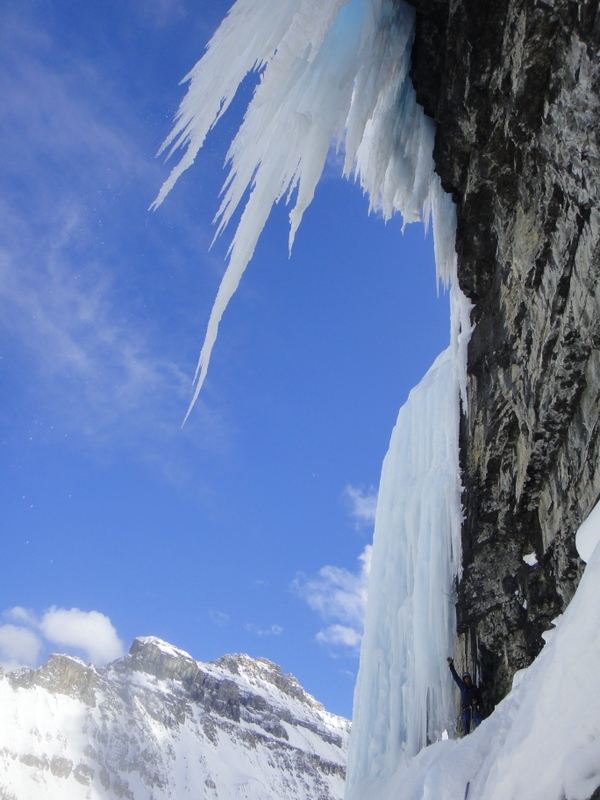 The Trophy Wall was still in the forefront of our minds and Nick’s drive to climb his final of the three classic routes on the wall – The Replicant – was becoming something of a pre-occupation but with the avalanche risk so high we decided to give it a few more days. 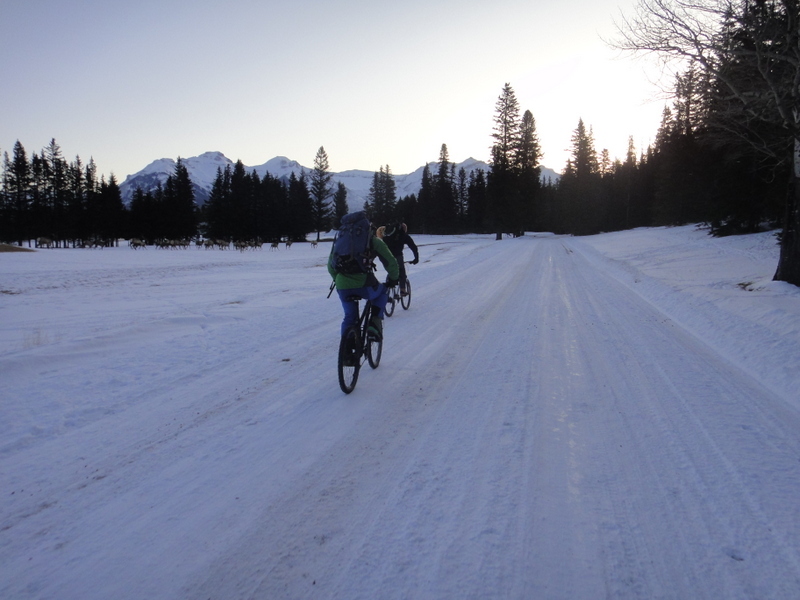 This gave us the chance to catch up with Jen Olsen, a friend we had got to know through the BMC International Winter Meet back in January. 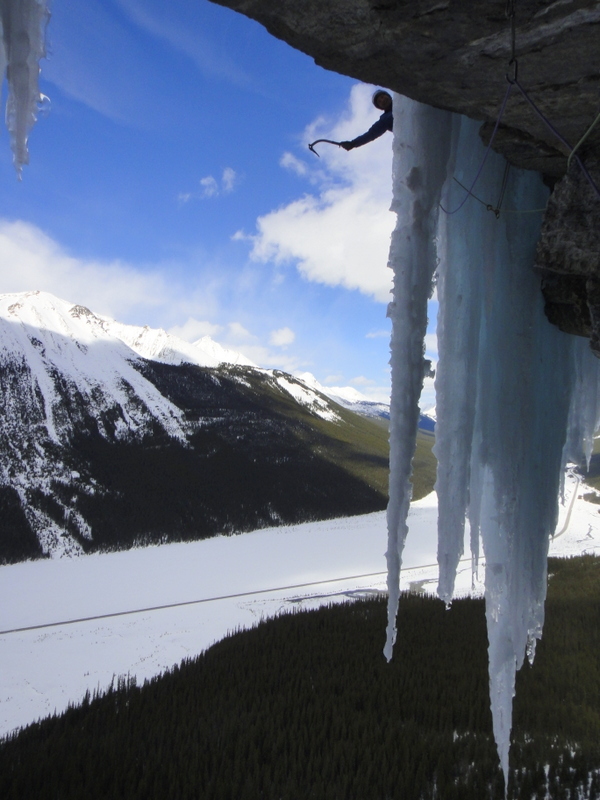 Jen is based in Canmore and works as a Guide, she has climbed extensively throughout the Canadian Rockies in both summer and winter and has represented Canada in the Ice Climbing World Cup. 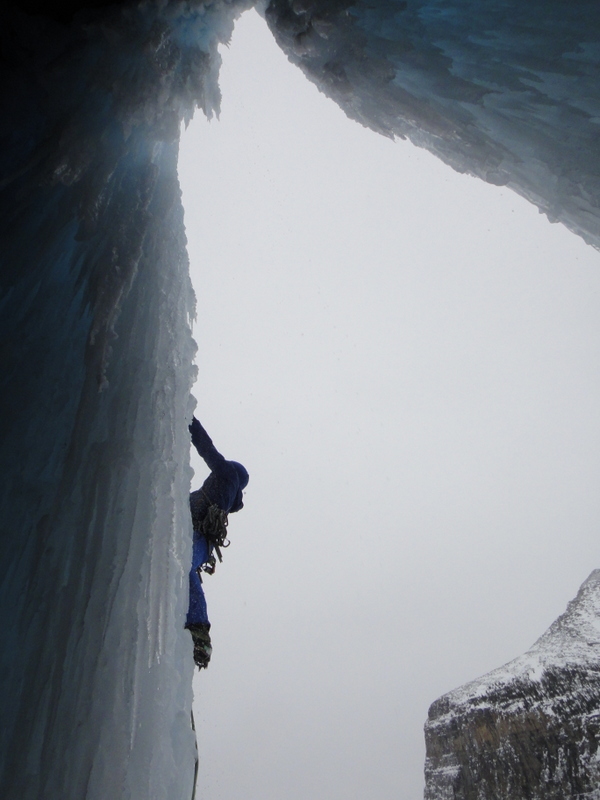 Her climbing on both ice and mixed ground was smooth and efficient, despite the fact she has recently taken time out due to injury. 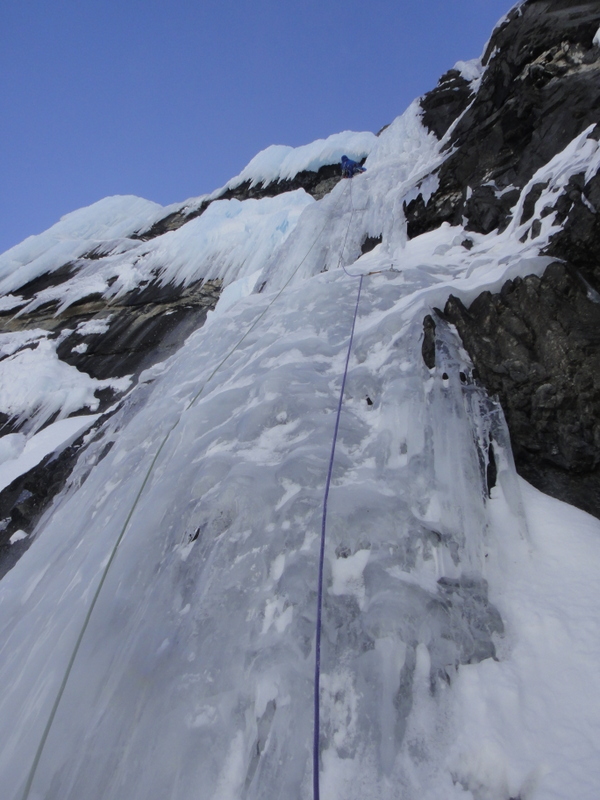 This style was shared by many of the locals climbers, their confidence on insecure placements was astounding. 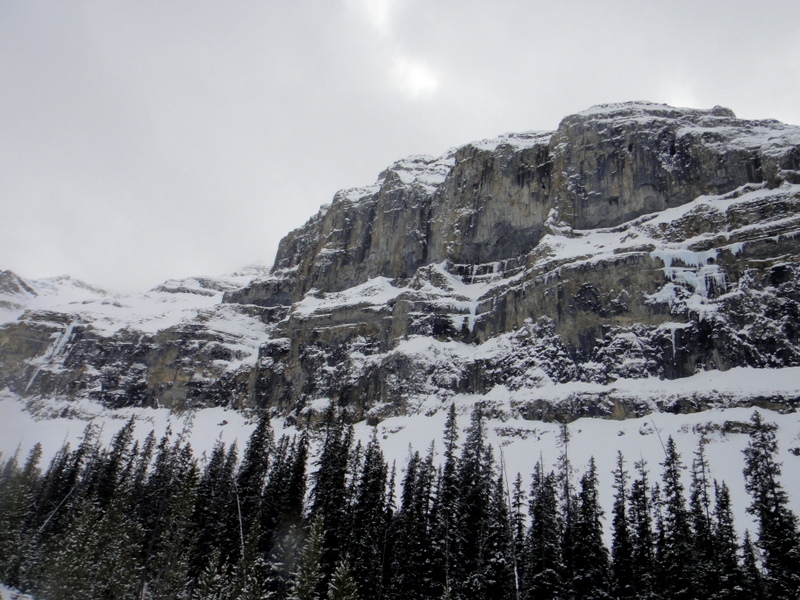 With the avalanche risk still high we opted for a trip up the Icefields Parkway to climb the Will Gadd route ‘Call of the Curtain’ – I’ll let the pictures do the talking. This route set the theme for avoiding the obvious lines and going for the more slender/marginal ones beside them, over the space of the next two weeks this happened time and time again. Up we went (again! ), this time armed with a shovel to plough a furrow through the 1 ½ metre deep snow that inconveniently lay over the approach. 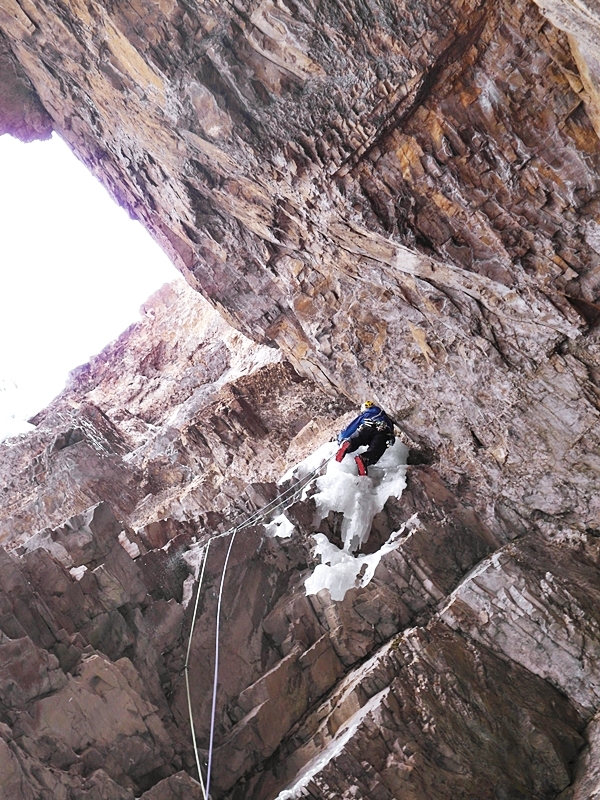 4 hours later we were close, but it wasn’t quite in the bag yet as we were barred access by a tricky mixed gully. 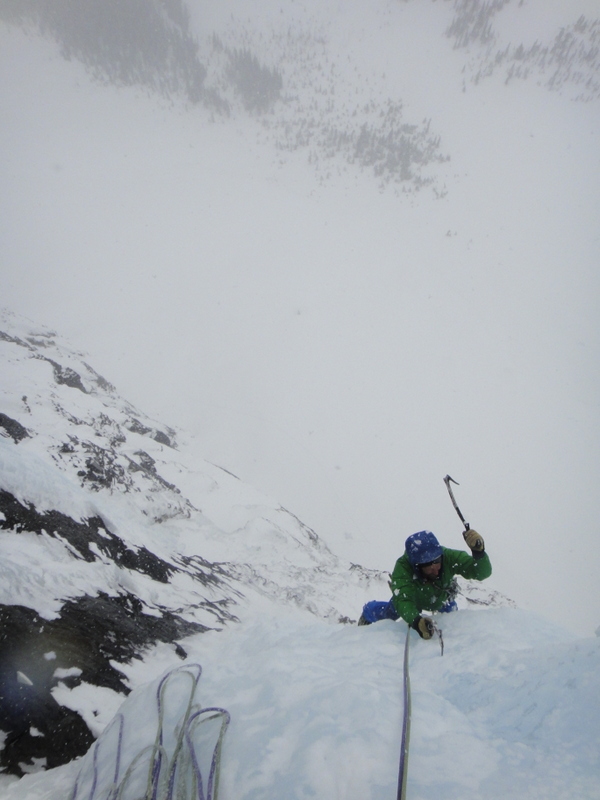 The following day we made swift progress back up to our previous high point, past the mixed gully (with some degree of floundering), and finally stood beneath The Trophy Wall. 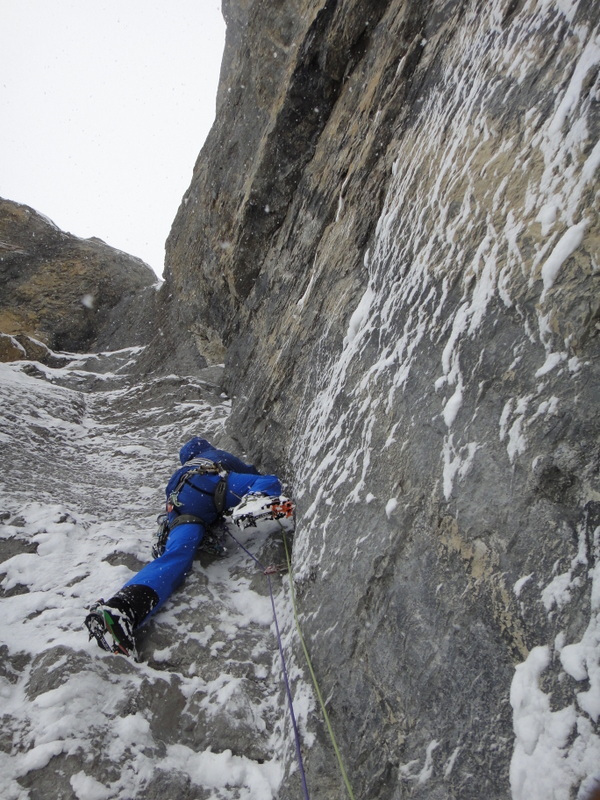 To read more about the impression the wall made on us visit my earlier post or Nick’s Blog. 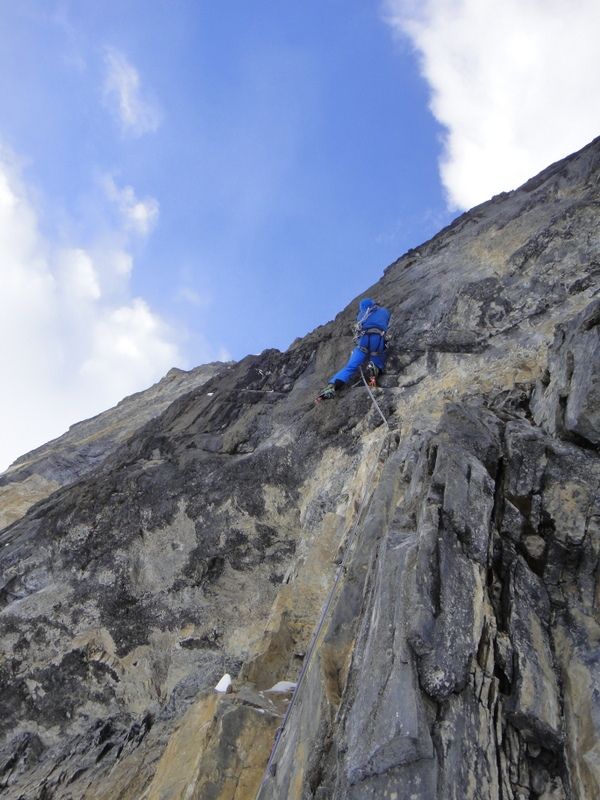 Partly due to the high quality of the routes and the effort it had taken to get the track up there in the first place we decided to engage in another outing to the T-Wall. However, this time we were armed with local Raphael Slawinski. 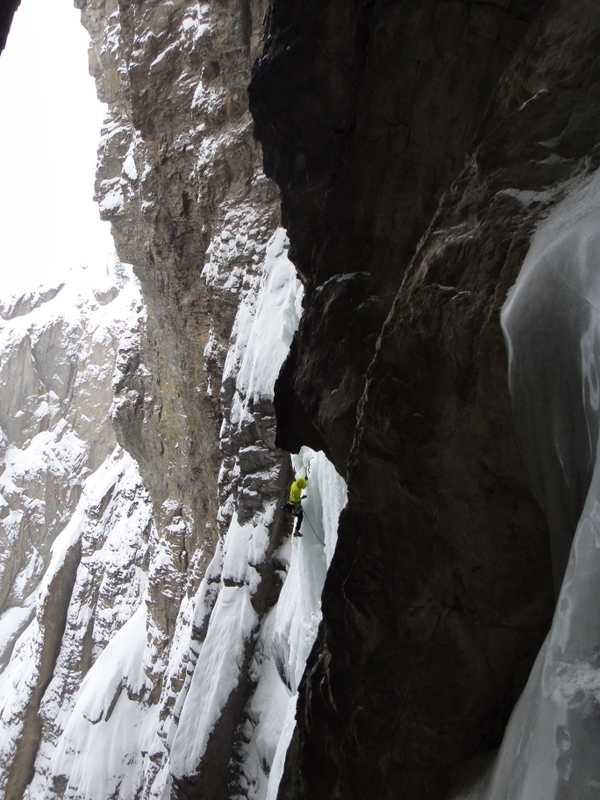 Now Raph isn’t a familiar name to many British climbers, but if you look through the list of hard first ascents in the Canadian Rockies then his name is at the forefront. He is officially the ‘sketch-master’, trusting placements that I couldn’t even identify and generally levitating up some seriously tenuous ground – oddly enough he reminded me a lot of Nick in that sense. 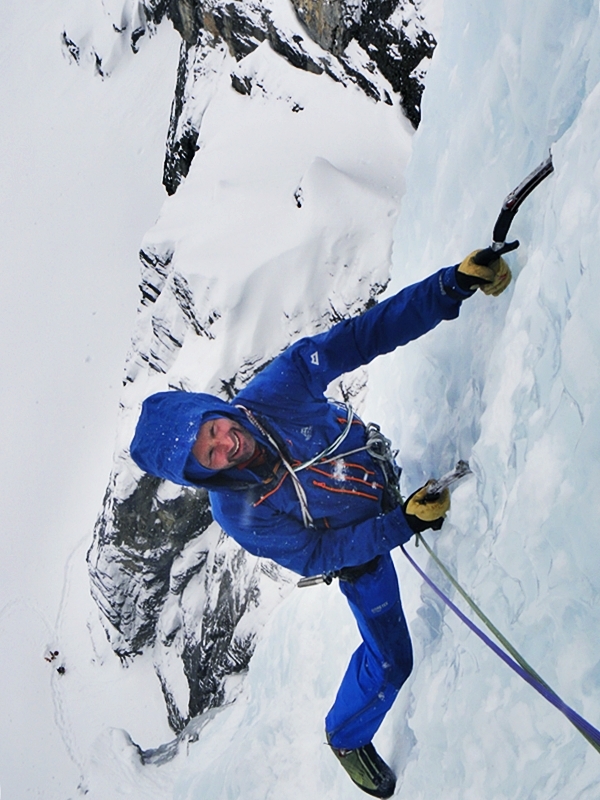 The moral of the story is – respect your elders – because the chances are they climb a lot better than you. If T is for Trophy then H is for Headwall – and there is only one HEADWALL. 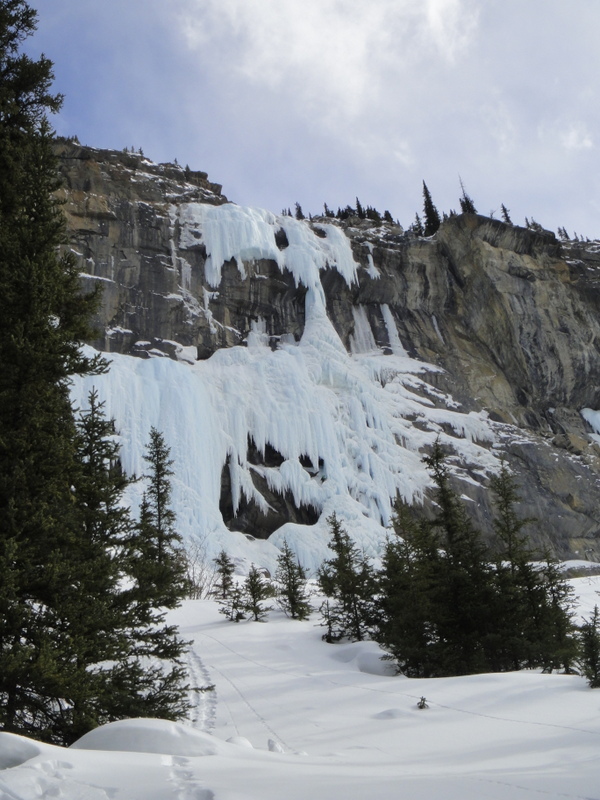 The Stanley Headwall is home to some of the greatest ice/mixed climbs in the world and became our focus for the final week of the trip. 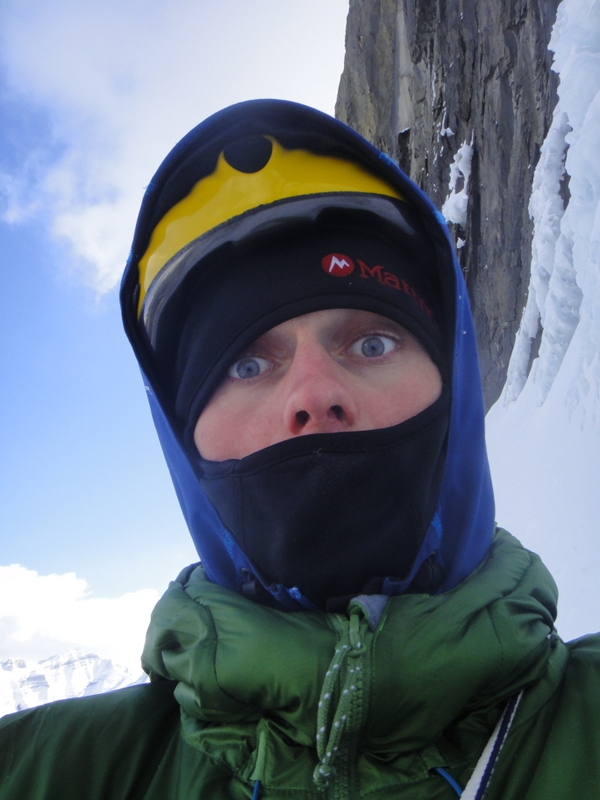 To get an impression of the wall its worth reading the following article written by none other than Dr Raphael Slawinski for Alpinist Magazine – click here for more. 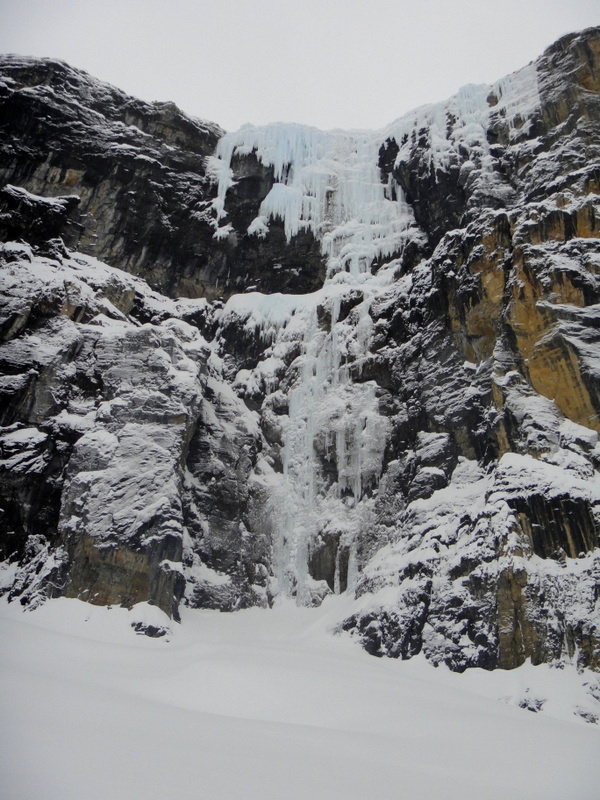 The place has a vibe: it could be the magical ski in, it could be the ever-present threat of avalanches, or it could be the fact that there is line, after line, after line of jaw-dropping routes. 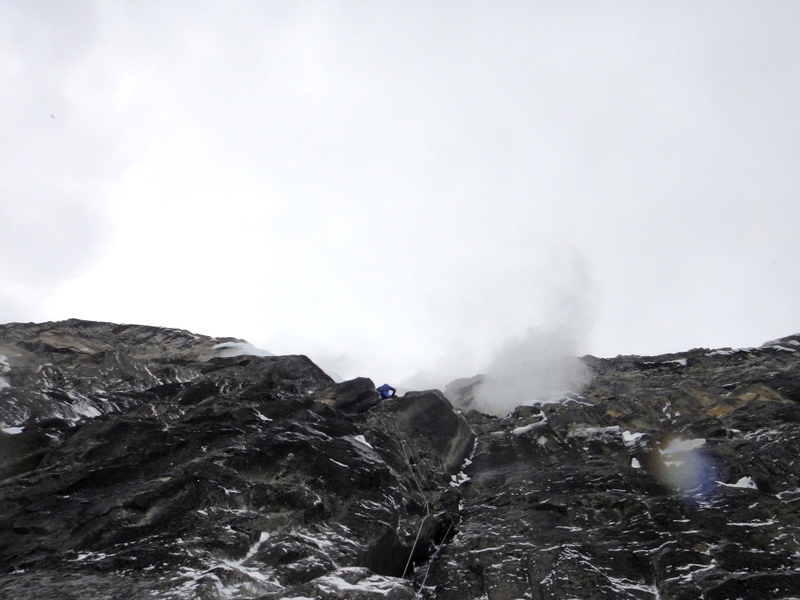 It is without doubt one of the most stunning places I have ever climbed (something I have now said twice on this trip). Glad the trip went well.